Will My Child Have a Say? During your divorce, hard decisions regarding your children are made. For example, where will they live? How often will they see each parent? The paramount concern in any decision regarding custody, parenting time, or other child-related issues is what is in the minor child’s best interests. But what happens when your child expresses a preference regarding who to live with? Nebraska, unlike some other states, does not allow a child to choose who to live with. Rather, the court may consider the well-reasoned preferences of a child, at any age. Nebraska law provides that your child’s preference regarding custody will be considered if your child is of sufficient age of comprehension, regardless of chronological age, and the child’s preference is based on sound reasoning. “Sufficient age” can be as young as 10, if the ten-year-old child is capable of vocalizing and reasoning.The older the child, the greater the weight given to the preference. Your child’s reasoning, regardless age, is also important. If your child’s wants to live with the mother because she is less strict, doesn’t impose rules or curfews, or gives a bigger allowance, the judge may give less weight to that child’s wishes. If your child expresses a preference to live with the mother because she helps with homework, counsels during emotionally-trying times, or reads and plays with the child, the judge may give greater weight to the child’s wishes. There are multiple ways your child’s wishes can be conveyed to the judge. It is possible for your child to speak with the judge. Again, there is no set age at which children are allowed to speak with the judge about their preferences as to custody. If either you or your spouse wants the judge to listen to what your child has to say, a request is ordinarily made to have the child speak to the judge in the judge’s office (or, chambers), rather than from the witness stand in the courtroom. This is called an “in-camera interview.” (Note: there are no actual cameras present. Rather, a court reporter may be present to transcribe your child’s testimony.) Typically, the parents are not present for this interview. Depending on the judge’s decision, the attorneys for you and your spouse may be present, or it may just be the judge and the court reporter. It is possible that the judge may also allow the attorneys to ask questions to your child. If you have concerns about the other parent learning what your child says to the judge, talk to your lawyer about requesting to keep your child’s testimony confidential. 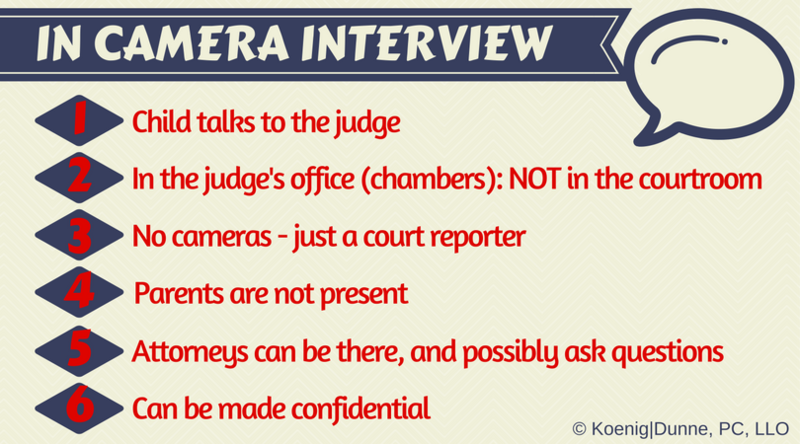 Finally, consider how going to a courthouse and speaking with a judge will affect your child. It may not be in the child’s best interests to go through this process if he or she is already struggling with the divorce. Or, perhaps you have a strong-willed child who is adamant about having his or her voice heard. Also, keep in mind that it is not unusual for the child to say one thing to one parent and something completely opposite to a judge when neither parent is in the room. Discuss the implications of having your child testify with your experienced family law attorney. Knowing the unique circumstances of your case, your Koenig|Dunne family law attorneys can advise you regarding the pros and cons of having your child speak with the judge.